(left) Gigi Leung, and (right) Fiona Sit are Wonder Women. Supposedly. The Skinny: A noble train wreck. Wonder Women is easily the most ambitious of the recent films celebrating the 10th anniversary of the Hong Kong Handover. However, it's also the most ham-handed and manipulative, and could use better writing, directing, and acting. Less product placement would help too. Gigi Leung returns to the big screen for Wonder Women, yet another Hong Kong film celebrating the 10th Anniversary of the Hong Kong Handover. Sadly, it's also the worst of the bunch. Leung is Joy Shing, who's just been promoted to Chief Financial Officer of a successful company. Unfortunately, Joy only got the position after her husband, To Lam (George Lam), was ousted as CEO on the eve of the Hong Kong Handover. To's replacement is Ching Bit-Chung (Nie Yuan), a righteous but also pragmatic fellow with Mainland ties, who takes a shine to Joy's obvious physical charms. Joy is initially oblivious of his attentions, however, and still loves To, who begins a disturbing spiral into self-pity following his firing. Feeling like a bit of a loser, he spends most of his time in Singapore trying to get back on his feet, while Joy remains back in Hong Kong with their infant son Lok. Unfortunately, things for Joy's family get much worse, and everything is tied into the most notorious of events in the past ten years of Hong Kong history. First, Joy is conned into overpaying for a flat by Uncle Nine (Hui Siu-Hung), who uses all his profits for massive real estate speculation. With the real estate crash just around the corner, that qualifies as Ominous Foreshadowing #1. Ominous Foreshadowing #2 involves To, who begins to play the stock market fast and loose, meaning he's about to run into the upcoming Asian Financial Crisis. Director Barbara Wong (Truth or Dare - 6th Floor Rear Flat) basically sets her ducks in a row before pulling the trigger, using the misfortunes of numerous characters to deliver a blow-by-blow parade of Hong Kong's recent financial and social maladies. People driven to bankruptcy? Check. Rising unemployment? Check. Death by charcoal suicide? Check. Crappy office politics? Check. SARS? Check. All these problems and more pop up during Wonder Women's running time, and they all directly affect Joy. How will this upright working woman survive Hong Kong's slings and arrows? The answer: with dignity, and perhaps more manufactured cinema twists than any film should have. Wonder Women takes ten years of trying hardships and basically loads them onto Gigi Leung's shoulders. Joy gets the Hong Kong hardship playbook thrown at her, such that each and every one of Hong Kong's recent problems affects her directly. This is in contrast to the other Handover anniversary ilms, Mr. Cinema and Hooked on You, which only indirectly dealt with historical issues, if not simply ignoring them. Wonder Women tackles the toughest of topics head on, so when the Asian Financial Crisis hits, we see someone dear to Joy go bankrupt. When SARS arrives, someone connected to Joy goes to the hospital. People may even die because hey, people died in real life. Wonder Women is unflinching in the drama that it brings to the screen, an obviously potent dramatic tactic as it basically forces the Hong Kong audience to watch and not be affected by stuff they feared as a part of their every day lives. The other films may have skirted around the tough issues, but not Wonder Women. The filmmakers' intentions here are admirable. However, the execution sinks this one. Hard. Hong Kong Cinema could have gone three-for-three with its Handover anniversary films, as both Mr. Cinema and Hooked on You were quality films. Though it tries to be quality, Wonder Women is ultimately not very good, and in fact could be seen as alarmingly bad, with awkwardly staged drama, inconsistent acting, and a self-importance that virtually dares the audience not to be affected by what they see. Many tragic events are presented to the audience, and on paper they affect. On screen? Well, many people may find themselves touched by what happens, as the blatant manipulation on display in Wonder Women is not without its power. However, that power is ill-advised and ncredibly transparent, and will likely not fool discerning filmgoers who expect more than the soap-opera plotting, countless contrivances, and ham-handed direction foisted upon them here. The film possesses some potent sequences, but other parts feel conspicuously light, like a condensed TVB drama or maybe just another one of those umpteen youth romance films. Fiona Sit shows up as Joy's assistant Tung, who takes up tons of screentime with girlish mugging and a storyline that's less "wonder woman" than it is "partially competent girl". She has an entertaining, though questionably relevant subplot involving a crappy boyfriend who sells her fake fashion items. Meanwhile, an honest, upright flower shop salesperson (Hins Cheung) pines for her day and night, and she manages to ignore his attentions for a good six years. Eventually, she (duh) gives him a chance, but this dramatic development occurs after we've seen people die due to suicide, SARS, and even emotional breakdowns. We're also given a virtual Powerpoint presentation on Hong Kong's financial ups and downs, complete with onscreen graphics and characters reacting to each stock market shift like they're placing bets at the jockey club. 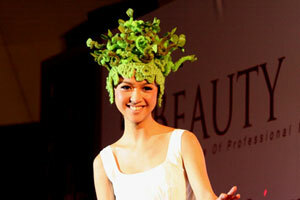 But wait, now it's off to a fashion show with Fiona Sit in green hair! Wonder Women is horribly edited; it doesn't segue from emotion to emotion effectively, and instead shifts abruptly. Sometimes, the onset of tragedy may even trigger laughs. This is probably not what the filmmakers had in mind. Barbara Wong has previously shown a talent for character and emotion, but for some reason that doesn't come through here. Joy is a character that's hard to pin down; she behaves inconsistently, and only achieves sympathy because so much terrible stuff is happening to her. Leung's acting isn't much help either; she's largely effective, but sometimes it's hard to tell if she's in a serious drama or a light comedy, and when she fails to convince, the effect can be egregious. The fault here may be the script and direction, which seems to put actors out on a limb without a net to save them. The drama is awkward, some characters never gain sympathy, and many of the plot twists are incredibly predictable. In Wonder Women, it always feels like somebody is pulling the strings, be it the director, the actors, or the screenwriters. The chintzy music score - which alternates between tinkly techno, maudlin string arrangements, and power ballad samples - seals the deal: this is an overcooked motion picture that, despite its reflection of reality, doesn't feel real at all.